Wonder Woman and La Borinqueña on Ricanstruction: Reminiscing & Rebuilding Puerto Rico. Though Puerto Rico might no longer dominate the headlines the way it did in the days and weeks after last year’s hurricane season left at least 1,000 people dead, there are still countless more people on the island who are still fighting to piece their lives back together. In the spirit of rebuilding, comics creator Edgardo Miranda-Rodriguez is partnering with DC Comics to bring his hero, La Borinqueña, together with members of the Justice League in Ricanstruction: Reminiscing & Rebuilding Puerto Rico. The comics anthology will feature stories from comics giants like Gail Simone, Greg Pak, and Reggie Hudlin along with newcomers like Gabby Rivera and actors like Rosario Dawson and Rubén Blades. 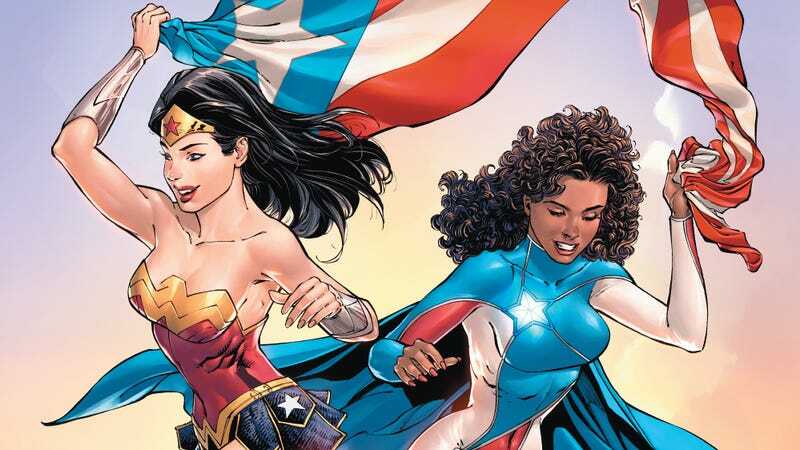 Each of the more the 100 stories contained within Ricanstruction will highlight a different aspect of Puerto Rican culture and history and 100 percent of the proceeds from sales from the anthology are being donated to outreach groups working to provide basic necessities like food and closing to those still on the island. Preorders for Ricanstruction: Reminiscing & Rebuilding Puerto Rico are open today and the book hits comics stores nationwide on May 23.